Trainer Aidan O’Brien’s hopes for a third straight win in the Investec Epsom Derby (gr. I) June 7 look to be riding on regally bred Australia, who took his initial step toward the second jewel in England’s Triple Crown with a close third-place finish in the first, the QIPCO Two Thousand Guineas (Eng-I) May 3 at Newmarket. 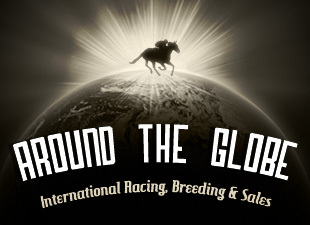 Currently the hot 4-6 favorite with British bookmakers Coral, Australia is a product of Thoroughbred breeding’s age-old formula: breed the best to the best. The colt has already shown he possesses the elusive X factor in that equation: racing ability—and O’Brien recently noted that he has always been an exciting prospect. Campaigned by Coolmore and partners and Meydan racecourse builder Teo Ah Khing, Australia is a son of 2001 Epsom Derby winner and leading sire Galileo. His dam is 2004 Epsom Oaks winner Ouija Board, the brilliant mare who was a two-time champion turf female in the United States and a two-time Horse of the Year in Europe. O’Brien is seeking an overall fifth Epsom Derby victory, following Galileo, High Chaparral (2002), Camelot (2012), and Ruler Of The World (2013). Australia was bred in Great Britain by Stanley Estate and Stud Co., the breeding operation of the 18th Earl of Derby, who died November 28, 1994, at the age of 76. The operation passed on to the 19th Earl of Derby, Edward Stanley, owner-breeder of Ed Dunlop-trained Ouija Board, and his brother, the Honorable Peter Stanley. They are descendants of the12th Earl of Derby, who was instrumental in establishing the Derby, first run in 1780. Ouija Board, a daughter of Cape Cross, posted a 10-3-5 record from 22 career starts in a brilliant career in which she earned more than $6.3 million. Wins in the Breeders’ Cup Filly and Mare Turf (gr. 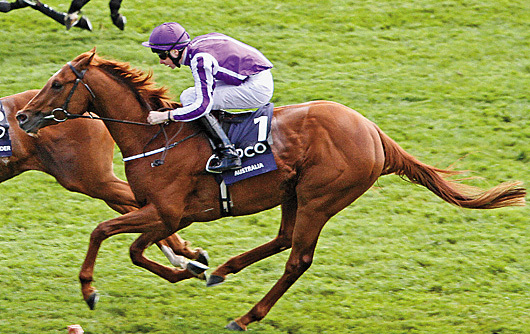 I) in 2004 and 2006 led to championships in the U.S. She also won the 2004 Darley Irish Oaks (Ire-I) and defeated males in the 2006 Prince of Wales’s Stakes (Eng-I) at Royal Ascot and 2005 Hong Kong Vase (HK-I) at Sha Tin. 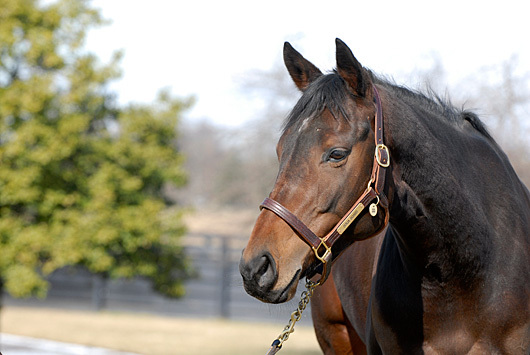 Ouija Board has produced four winners from as many to race—though none of her caliber as yet–including the Kingmambo gelding Voodoo Prince, a group III winner in Australia and stakes-placed in England. Her fourth foal, Australia is a chestnut colt born April 8, 2011. He was offered at auction through the Watership Down Stud, acting as agent at the 2012 Tattersalls October yearling sale, where Australia was offered in the elite Book 1 catalog. Coolmore bloodstock adviser Demi O’Byrne went to 525,000 guineas ($841,313) to secure him for Coolmore principal John Magnier. “Australia is uncomplicated, relaxed and has speed – exactly what you want in a racehorse,” O’Brien said. “He is a horse you have to work out all the time – he is so relaxed; he is always yawning! Australia posted a 2-1-0 record from three starts as a 2-year-old. He took a seven-furlong maiden at the Curragh in July in his second start and subsequently won the Breeders’ Cup Juvenile Turf Trial (Ire-III) at Leopardstown in September, defeating previously unbeaten Free Eagle by an eye-catching six lengths, to conclude the season and stamp him a Derby candidate. His classic campaign began with his season debut May 3 at Newmarket when he was a staying-on third, beaten three-quarters of a length, behind Night Of Thunder in the Guineas, Britain’s first classic of the season. But the start of the 2014 season saw illness among a number of O’Brien runners, including Australia. “Australia was sick around seven weeks before the Two Thousand Guineas and was among the first to start coughing, but he managed to get over it in a week,” O’Brien said. “We were excited by Australia ahead of the Guineas as he had really come on and treated his work companion Oklahoma City with total contempt in the build-up. O’Brien’s son, Joseph, has the mount on Australia for the Derby. “Australia has pace but is also well-balanced and has a good temperament – you really cannot fault him,” he said. “I wouldn’t want to swap him for anything else at all either in the Derby or back over mile. Aidan Brien is considering three other runners for the Derby: Chester Vase (Eng-III) winner Orchestra (20/1 with Coral) and Dee Stakes victor Kingfisher (33/1), both sons of Galileo, and 2013 Beresford Stakes (Eng-II) winner Geoffrey Chaucer (14/1), a son of Montjeu. “No matter what anyone says the Derby is the total test,” O’Brien said. “It is the total test of speed, stamina and tactics run over an undulating course. It is the ultimate test, our Olympics and what the breed is all about.